Spectacular views of Mt Constance with unseasonably warm temperatures and a great workout at ~7 miles/~5000' gain to Point 5345 (a.k.a. Valhalla Peak). An inversion produced freezing temperatures at the cars with warm temperatures up above. Most of the trail was snow free with the first snow encountered at ~4200’ and continuous snow at ~4800, with a snow free summit ridge crest. 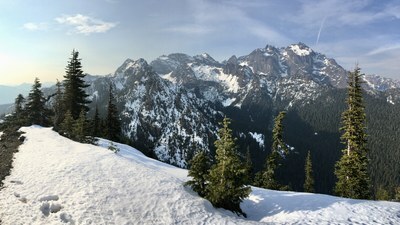 For anticipated conditions we brought snowshoes (for snow up high), crampons (for hard snow/ice), and microspikes (for the steep slippery trail), yet none were necessary (due to Mr. Inversion ;). Most difficult part was transition from snow to trail on descent as the 3-4” layer of snow kept breaking away for some down hill acceleration (microspikes would not have helped). Spectacular views of Mt Constance with unseasonably warm temperatures. Very hazy conditions near the summit with a smokey smell in the air (all the way from the California fires???). We left the cars at 8:30am, reached the summit at 12:45pm, began our descent at 1:30pm, and reached the cars at 4pm for a total time of 7.5 hours (4.25 hours up, 2.5 hours down). Photos from this and other trips at this venue can be seen here.